10 tablets in blister. Outer package - carton. Combined anesthetic and anti-inflammatory effect. Long-term analgesic and anti-inflammatory drug. 1 tablet for medium and large dogs contains diclofenac sodium - 2 mg and drotaverine hydrochloride - 12 mg (as active ingredients); 1 tablet for small dogs and cats contains diclofenac sodium - 0.4 mg and drotaverine hydrochloride - 2.4 mg (as active ingredients). Diclofenac sodium (nonsteroidal anti-inflammatory drug) has frank anti-inflammatory, analgesic and antipyretic properties. Drotaverine hydrochloride (myotropic antispasmodic drug) induces smooth muscle laxation and exaggerates blood vessels. After Vetalgin oral administration active ingredients rapidly absorb in gastrointestinal tract and penetrate in most organs and tissues obtaining peak plasma concentration in 1.5-2 hours. Peak active ingredient concentration is observed in joint cavity synovial fluid and remains at therapeutic level within 12 hours. 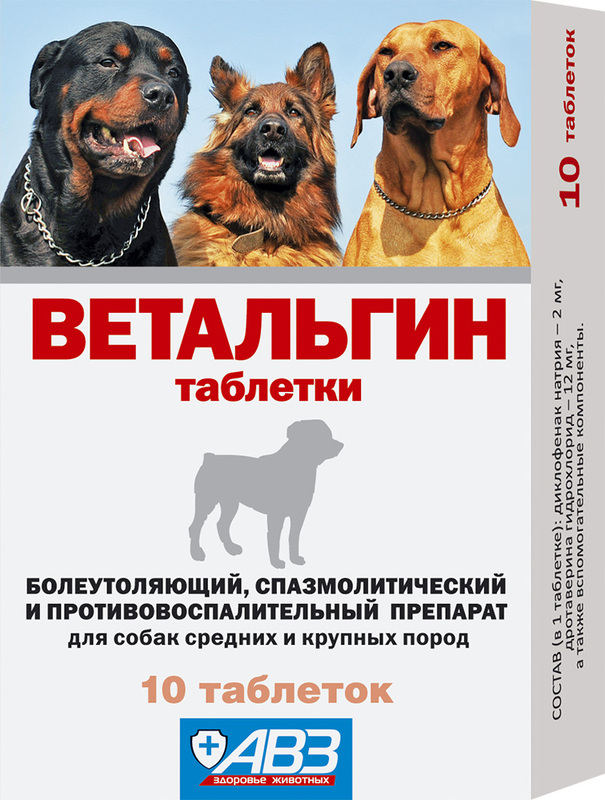 Use Vetalgin (all alone or in combination with other drugs) in dogs and cats with degenerative diseases of joints and spinal column (rheumatoid arthritis, arthrosis, osteoarthritis, spondylarthrosis), neuralgia, neuritis, bursitis, synovitis, tendinitis, tendosynovitis, injuries, tensions of ligaments, muscles and tendons, inflammatory soft tissue oedemas, posttraumatic and postsurgical pain syndrome, smooth muscle spasms associated with diseases of urinary system and gastrointestinal tract. Do not use in case of increased individual sensitivity to nonsteroidal anti-inflammatory drugs, dysfunctions of liver, kidneys and hematogenesis organs, blood losses and bleedings, gastrointestinal ulcers, as well as in pregnant and lactating females. Do not use in combination with nonsteroidal anti-inflammatory drugs, glucocorticoids and anticoagulants, as well as in animals under 2 months old. Vetalgin is intended for individual oral administration, a whole tablet once or twice a day during feeding in following doses: medium and large dogs - 1 tablet per 10 kg of body weight; small dogs and cats - 1 tablet per 2 kg of body weight. Do not divide a tablet before use. Treatment course is 5-7 days. Store in closed original package at 0-25°С. Protect from light and moisture. Shelf life is 2 years from manufacturing date.